Vintage echo sounds brought up to date & alive! Thanks to everyone who took the time to listen to the samples from my three eTap2HW-based EchoTapper variants and cast a vote in my poll on which sound they preferred. There was a very clear preference for Track ‘C’ which polled 55% of the votes, in second place was Track ‘B’ which polled 30% and coming well up the rear was Track ‘A’ with a mere 15%. Which really makes me wonder about all the fuss and hullabaloo on some of the Shadows forums regarding how ‘good’ the valve preamp-based units sound. My personal opinion is that the valve preamp sounds too ‘mellow’ with not enough bite to get the sound of the early Shadows recordings. It does sound nice but comes nowhere near ‘that sound’ but maybe with some modifications to the circuit it could get closer – we shall see. Incidentally, I also prefer the sound of the modified FET preamp, it gives more gain and punch though Piet’s original FET design is also excellent and the results of individual units can vary depending on the wide manufacturing spread of the specs for individual FETs. The original sound samples are still available here if you’d like to audition them (again). This entry was posted in Audio, FET, Tube, Valve on August 20, 2013 by guitarphil. This pdf contains a wiring diagram to show how to interconnect the eTap2hw motherboard, Piet’s Universal Interface shield and the pots and input and output jack sockets to complete the basic wiring of an automated echoTapper unit using Piet’s original FET-based preamp design. The wiring of the valve preamp unit will be covered at a later date. It is assumed that you will connect the Arduino Uno, the Universal shield and the Adafruit LCD shield by stacking them one on top of the other (in that order) using ‘stackable’ headers, with the whole ‘stack’ mounted on the front panel via suitable M2.5 bolts and nuts. This earlier post shows what I mean. The Universal Shield mounted on top of the Arduino Uno. Note the use of stackable headers to allow the LCD to be mounted on top. It is also possible to mount the LCD separately on the front panel and connect it via four wires to the Universal shield’s I2C connector (top left in the photo above). The Uno and Universal shield would then be mounted perhaps in the base of your unit. This would be absolutely necessary if you are mounting the unit in a 1U 19″ rack mount as the Adafruit LCD will not fit as it’s too deep. Piet should soon have available a special LCD/Buttons kit that is specifically designed to fit a 1U rack panel which will also connect via the I2C connector. This entry was posted in Hardware, Wiring Guide on August 8, 2013 by guitarphil. I’ve finally got around to making some demo recordings to compare the sounds of my three different EchoTapper Vintage Echo units. In case you haven’t been following the story in this blog, I have (so far) build three different incarnations of the eTap2HW echo machine based on the original work of Piet Verbruggen. Piet created the DSP programming of the Spin Semiconductors FV-1 chip which provides the emulations of the various vintage echo machines and he also designed a motherboard with a Fetzer Valve preamp and other support circuitry on which the FV-1 module is mounted. Mark I – is a manual unit built on Piet’s motherboard design with a modified FET preamp. The modifications involve re-biassing the FETs following the work done by Steve Mitchell. Mark III – is a fully automated unit, with a two channel valve preamp using two 6N3 dual triode valves obtained ready-built from Hong Kong via an eBay seller. 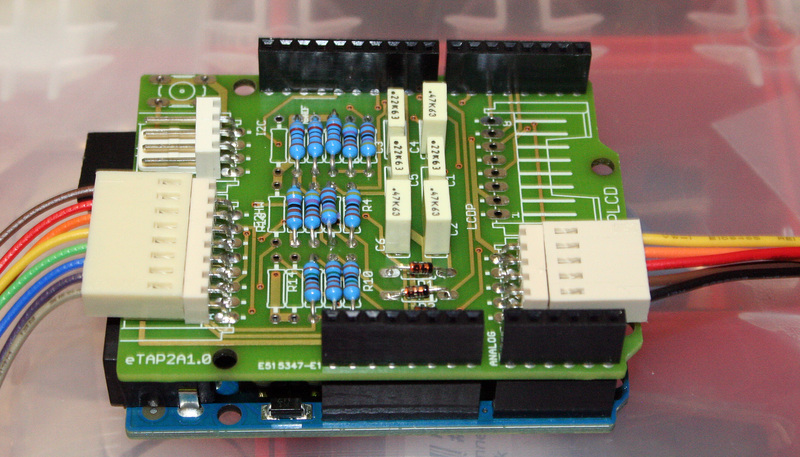 The unit uses an interface board designed by Eric Thacker to interface between the preamp, the FV-1 module and the Arduino Uno. The guitar used was my custom built ‘Hank’ with Fender 57/62 Vintage pickups. The bridge pickup was used throughout with the guitar volume control on full (10). The sound was recorded using a Samson CO2 condenser microphone placed approximately 9 cm out from grille cloth, and about 15 cm in from Left edge of cabinet. The microphone was connected to Channel 1 on a Focusrite Saffire Pro 24 audio interface, on which the gain was set to 6. The sounds were recorded (one at a time ;-)) at 48 kHz, 24 bit WAV, on separate tracks in a Reaper DAW. A send was created for each track and the signals were sent to a separate FX track which had an EQ and a Reverb plugin added. This ensures that all the recordings receive exactly the same effect treatment before the final mp3 tracks were rendered. The echo units were set as follows, essentially to attempt to replicate the same settings as far as possible. The differences in the three preamps would have a bearing on where the input Level controls of each unit should be set but the two FET-based units both had their input Level set to 5. The valve unit has an input Level and an Output Level control so it’s difficult to compare these directly with the FET units. The Mark II and Mark III units were both set to use the built-in Atlantis patch which is taken from the suggested settings of Dave Robinson. The controls on the Mark I (Manual) box were set to match this as well. The figures in brackets are the approximate stored digital values associated with the knob positions in this patch in the automated units. The lead guitar has been kept fairly high in the mix so that the differences between the units (if any) can be heard more clearly above the backing track. All tracks were done in one take with no overdubs or punch ins. This entry was posted in Audio on August 5, 2013 by guitarphil. This entry was posted in Video on August 4, 2013 by guitarphil.